The Horror Movie BBQ: Watch Out Cobra, The Fridge is Coming Through! Watch Out Cobra, The Fridge is Coming Through! 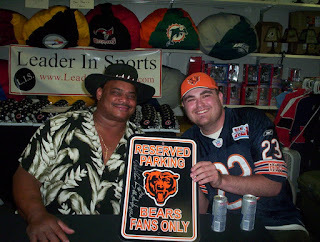 I'm a Chicago Bears fan. I'm also a lifetime G.I. Joe fan. So, how does one combine both interest into one great, beacon of light that will entertain children for years to come? Well, it's your lucky day, pal! Time to Super Bowl Shuffle all over Cobra! Yep, that's right! In 1987, Hasbro offered an exclusive mail-away offer that shook the world to it's very core. 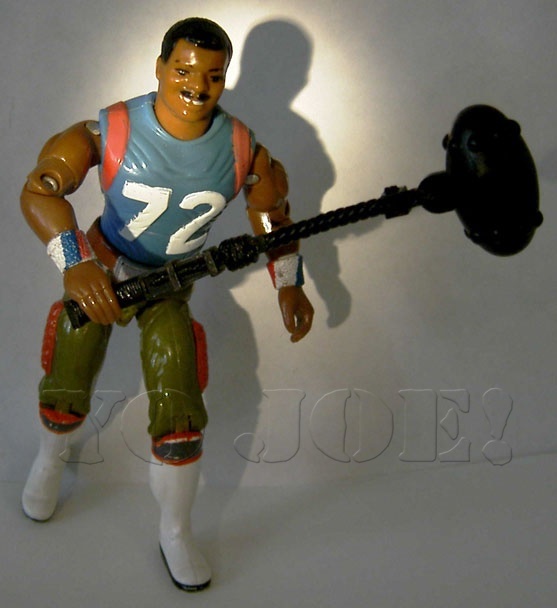 Chicago Bears mega-star William "The Fridge" Perry was now available as a GI Joe action figure, thanks to sending in just a couple proofs of purchase and a slip that featured the lovable Monster of the Midway. By 1987, Perry's star was at a peak. He'd appear on tv shows, advertisements, and even Wrestlemania 2. But since then, he hasn't really done much other than sadly suffer from problems due to his large frame and get inducted to the WWE Hall of Fame. But his legacy of winning Super Bowl 20 lives on in plastic form. Let's take a gander, shall we? Ok, so if I had a mint sample to photograph and goof around with, it may be better to look at, but oh well. Dem's da breaks. Standing at 3 3/4, Fridge is one of the Joes Special Training Instructors which is a rather dubious rank for the Fridge, considering his weight was over 400 at this point. I'm not saying I'm a perfect specimen, but taking special training from a 400 pounder who is known for his eating hotwings in KFC commercials isn't really the best use of Military time. However, the Fridge is an imposing figure. You can tell how serious he is about this new career, despite his penchant for greasy fast food. He abandoned his Bears stripes for a sleeveless tee with his number "72" and a GI Joe belt buckle with strange green pants and white boots. He also completes the ensemble with tasteful red, white and blue wristbands. That's dedication right there, people. The sculpt of the figure had to be a fun project for the sculptors at Hasbro. "Just make him as basic as you can, but remember to include the number 72 on his shirt" is what I imagine the orders given. And to be fair, there's not much you could do with the Fridge. He's a giant with a gap in his teeth who runs around with a football. He's not exactly GI Joe material, but let's pretend he is for a moment. 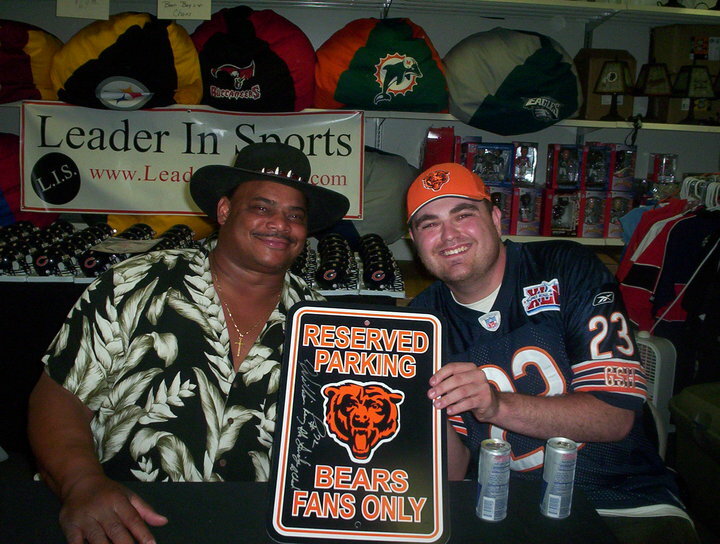 The Fridge could be seen rolling like a bowling ball through the end zone at Super Bowl 20, so just imagine him bursting through the doors of the Terrordrome and knocking over a bunch of Cobra Vipers who were just sitting around playing cards. Call me crazy, but that makes sense to me why'd the Joe's recruit him. Much better than using Bazooka, I'd say. Much like any Joe figure, he came with an accessory that suits him well. But since I only have a loose, beaten up figure, I don't have his accessory. So, thanks to YoJoe.com, here's a picture of him with his Football on a Stick. I'm not sure the weapon is the most imposing way to battle Cobra, but like I said, it suits him and kind of makes sense. Despite looking like a boom-mic, I can actually see why it would work in battle. Especially if it's like that giant steel football from Flash Gordon. Now, a modernized mace with a football at the end of a chain being swung by a giant football player is pretty scary sounding after all? The figure apparently came with a belt buckle and wristbands variants, but my figure is so worn out, I just don't see how it matters. I'd imagine whoever had this as a kid decided that the Fridge was better used as a tag team partner with Sgt. Slaughter as they beat up Raptor and Dr. Mindbender and Fridge taking the brunt of the beating. I don't know. I picked this figure up at Chiller Theatre 2004 for two bucks. I wasn't expecting a piece I could display in a China cabinet. However, the thought I could have Fridge teach the rest of the Joes the Super Bowl Shuffle and share his stories of defeating the evil Big John Studd at Wrestlemania 2, was the only thought in my mind. In the 1980s, it seemed every big celebrity had an action figure. Chuck Norris, Mr. T, Sylvester Stallone, and now the Fridge. It was a time to be a child who played with action figures. If you were around for the Fridge's heyday or just a Chicago Bears fan, it's a pretty fun figure to own. Definitely not a figure that would be produced today. Which is a shame. I'm sure someone like Brian Urlacher would've been a popular mail-away. Until that day comes, a Salvo figure will have to be the base for your custom. "I told ya that I would Super Bowl Shuffle up and down yo face!" Bonus feature! Here's a photo of me and the Fridge in real life, followed by the advertisement trumpeting the Fridge's arrival.